There really aren’t any fancy moves involved in cooking this iconic spring holiday staple once you understand about lamb and how many ways it can be cut. First, let’s get through what lamb is. Customers ask for “spring lamb” meaning an animal that is in the 3-5-month-old range. I like to refer to them as milk-fed lambs since ewes will naturally wean off their young by that time. Please do not ask your farmer for a spring lamb and then complain about the fat content. Spring lambs are supposed to have fat. It is when they become “teenagers” between one and two years of age (a.k.a. hoggets) that they begin to grow lean in a gangly fashion at the onset of sexual maturity. The size of the leg is not always indicative of age. Larger breeds of sheep will produce larger legs. At the same time, there are breeds that even as aged adults would produce a leg roast of only a few pounds. Additionally, there are multiple ways that producers have their lambs butchered leading to assorted sizes in leg roasts. Let’s take a look at them. A primal cut is when the butcher breaks down a whole animal into six cuts by first halving and then separating the front, middle and rear sections. A primal leg includes the shank, leg and sirloin, meaning the entire hip bone and ball joint, femur, tibia and fibula. This is a great option for family gatherings requiring a larger roast. Left intact, this is a long cut. To help facilitate fitting into a roasting pan and oven, the tendon between the shank and leg can be severed to allow the shank to bend. However, if you want to use the classic carving method with a manche a gigot (leg bone holder), you will need to leave the joint intact and ask your farmer to have the knuckle end of the shank removed by the butcher. This cut has the sirloin removed down to the ball joint of the leg, but the shank remains attached. As mentioned, the shank can have the tendons cut to allow the joint to bend so it fits into a pan easier. This cut of leg is also a great cut for Passover as the shank can easily be removed and added to the Seder plate. This cut is traditionally what Americans refer to as Leg-of-Lamb when purchased commercially. There is no sirloin or shank, only the largest muscle group on the upper leg with a single bone (femur) running the length of the roast. The consistency in thickness makes this the easiest to roast and to butterfly. This is the boneless version of the American Leg or the Whole Leg with Shank. This is also one of the fastest cooking cuts as it can be opened up and laid flat, such as with grilling. Boneless legs are great for stuffing, re-rolling and tying up with string prior to cooking. If you want to try your hand at de-boning your own lamb leg, Saveur has a great little video to show you how. This roast will also be the most expensive option as there were extra costs incurred through fabrication and weight loss with the removal of the bones. This is the most decadent roast short of an entire young lamb to grace a holiday table. It consists of both rear legs, sirloins and loin, being cut at the point of where the rack begins. In many parts of the world where resources are limited (islands, deserts), the harvesting of very young male lambs is common to reduce the use of resources (milk, grass). It’s a good idea to talk to your farmer now if you want to try this next year. If you are feeding a large crowd, consider purchasing two smaller legs, a leg and a shoulder or an entire half. With a little planning, the most economical way to serve a large crowd would be to purchase an entire lamb cut to order. This leaves you with a premium holiday meal plus convenient cuts like rib chops and ground or hard-to-find cuts like a whole neck roast, breast and short ribs. Ah yes…the bones! Both raw and with the bits left over from a well-picked over roast make for excellent bone broth and seasoned stock. No matter which cut you choose, here are a few tips. Allow the roast to come to room temperature prior to cooking to prevent longer cook times and uneven cooking of the meat. Skip the marinade. Leg-of-lamb is already a tender cut and does not need the added salt and acid to break down tough proteins. Sear for 10 minutes at 450 degrees F and then reduce the oven temperature to 350 degrees F for 10—15 minutes per pound depending on your preference for doneness. Using a meat thermometer, 130-140 degrees for rare, medium at 140-150 degrees and above 150 degrees for well done. ALWAYS USE A MEAT THERMOMETER!! Insert to the thickest portion of the roast to test. Allow the roast to rest for at least 15 minutes prior to cutting. And when you cut, slice against the grain, meaning you are cutting across the muscle fibers and not along their length. For a crispier surface, dry-age the roast in the refrigerator uncovered and patted dry for a few days prior to cooking. Season at the time of cooking. Not to discriminate, all this information applies to goat meat, too! My mom is the matriarch of East Pine Street, having lived there the longer than any other of the residents. Many of her neighbors are young families similar to her when my parents moved there in 1968. When I showed up for a visit this week, I found her raking her gardens and cleaning up detritus from last fall and winter. “It’s the season,” she said, pointing out that once she began her annual rites of spring many of her neighbors followed suit. Let your grass get too tall or weeds take over your landscaping, and she’ll notice. Fortunately, I live in the middle of a hay field so I need to let my grass get tall before it’s mowed. That’s called hay season. While highly subjective according to the position of the sun, hormones, weather, planting and harvest, seasons signify change. Last Sunday kicked of the regular season for Bethesda and NOVA Central Farm Markets. For vendors, that meant getting to market an hour earlier as the markets now open at 9:00 am. However, I needed to point out to several customers that the Saturday markets’ season won’t start until later—April 27th for Pike and May 4th for Westfield. “That’s kind of dumb,” one customer remarked, and I had to have a conversation with them about seasonality. Many of the vendors at the seasonal markets are outdoor growers. While Mother Nature may be gifting us with warm weather, for farmers that means getting young plants started in a greenhouse into the ground so they can G R O W. Two weeks ago, it snowed where I farm. With a significant investment in time and money getting seeds started, farmers are careful about their outdoor plantings knowing well that cold weather can stunt or worse, kill their hard work setting back their season even further. Recently, I had a customer at market casually ask when artichokes would be in season. I correctly pegged them as a transplant from southern California and then had to drop the bomb—there is no artichoke season here in the East. If they want artichokes, they’ll have to settle for the shriveled balls found at grocery stores which after all these years I still cannot bring myself to buy. How do you know what is in season at the markets? One way is to sign up for the Central Farm Markets’ weekly email. We’ve prominently featured What’s in Season at the Markets in the eblast highlighting what’s new, what’s plentiful and what to get before the season ends. Other ways to be in the know are to follow Central Farm Markets on Twitter, Facebook and Instagram. If you’re not into social media, listen to the weekly radio show, Foodie and the Beast every Sunday at 11:00 am on Federal News Network’s 1500 AM to find out what’s fresh at the market. By staying in touch, you’ll know when harbingers of the season arrive at the markets. Folks are already asking about asparagus and strawberries. Ramps and fiddleheads showed up for the first time last week. Once the season for your favorites arrives, remember those goodies are going to disappear when the season is over. Some farmers are able to extend their seasons using greenhouses, but delicate seasonal produce such as fresh peas, green beans, summer squash, berries and fruits come and go. The key to enjoying seasonal delights year round is to stock up during the season and learn to preserve. Pickled ramps are easy and make great additions to salads and martinis. Berries can be frozen on sheet pans and then stored in containers without ending up as one big frozen clump. I like to pop a few in a blender with yogurt for a delicious and nutritious smoothie! It’s worth it to learn to blanch, bag and freeze. 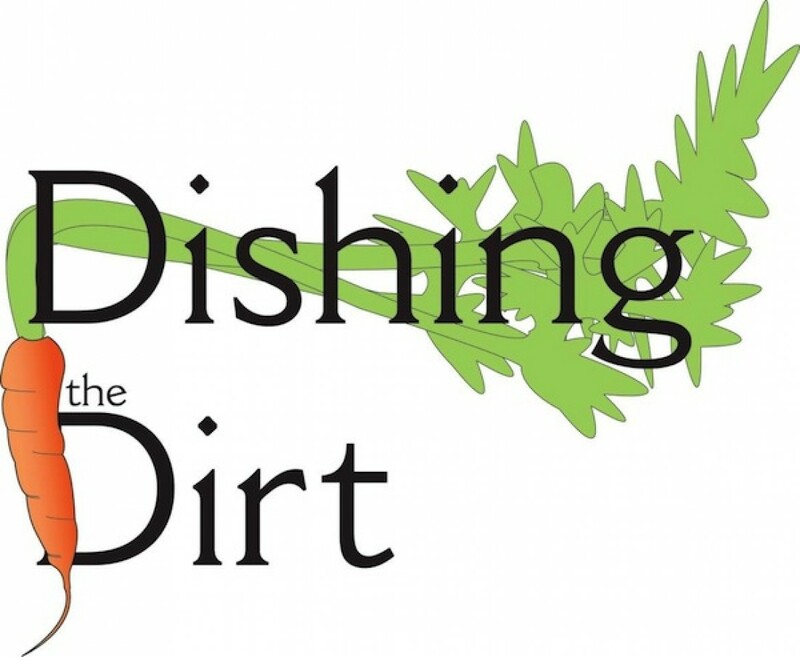 Stay tuned to Dishing the Dirt throughout the seasons to learn how to serve, cook and preserve what’s in season. Last week when the Certified Organic farmers didn’t make it to market due to a family emergency I overhead a customer remark, “I only buy organic, so I don’t have to wash it,” as she stood in front of a poster advising customers to wash ALL vegetables and fruits, even the Certified Organic ones. While many vendors, both Certified and non-certified, wash their products to remove the dirt in which they are grown, others do not. Thanks to the University of Maryland Extension, growers have free access to multiple resources in regard to food safety. When the colorful posters appeared at market earlier this year, I thought to myself, “Who needs to be told to wash their produce?” Now I know. Why must you wash your produce? Turns out there are a number of good reasons. Dirt. Bacteria. Viruses. Bugs. These are the reality of a biological existence. First, how many times have you picked up produce with your hands, but it down and chosen another? How many people before you have also done that? Who knows where all those hands have been? Secondly, produce is grown in dirt which is not sterile. Imbalances in the form of bacteria, especially from polluted or contaminated water happen regularly, either from natural occurrences such as flooding or man-made conditions like nutrient run-off. We all live downstream. Outdoor row crops interface with nature be it a bird overhead or a deer darting through the fields. Heavy rains can splash fine dirt on to leaves that if not washed will leave diners feeling as if they’ve been eating sand. Tractors drive over top kicking up particles of dust mingled with exhaust. As farmers, we get to see up close and personal how critical it is to have a living, breathing soil full of fungi, microbes, slugs, bugs, beetles, earthworms, wasps and nematodes. We know what benefits a good dose a compost does for the plants. I know vegetable farmers who are even particular to the type of cow manure—from the heifer barns only—that he puts on certain vegetables. There are farmers who build their own soils from scratch using composts, amendments and beneficial inoculants. We often speak about how far removed from their food sources people have become. Even though I know I’m the only one who has touched the vegetables I grow in my own garden, I still wash everything (except cherry tomatoes I eat straight off the vine) because I know there are skunks, opossums, cats, rats, raccoons, snakes, turtles and toads who all make their homes among the food I grow. At market I get three different kinds of carrots—loose carrots, carrots in a bag and carrots held together by a rubber band around their leafy-green tops. Beets come this way, though they are more likely to be in a box rather than a bag; radishes, too. I wash all of them. Sure, the loose and bagged carrots may not be sporting the dirt as the banded bunch and may not need as much of a scrubbing, but they still get rinsed. What is the best way to wash your produce? There’s no need for a sanitizing agent like vinegar; plain tap water will do fine. For smooth-skinned fruits and vegetables, a good rinse under running water is best, but a wipe-down with a damp cloth will also do. Leafy greens—even those that come in plastic containers—get a rinse in a colander, a soak if they are gritty to the touch. Think of spinach harvested after a rain. Those leaves are like dirt magnets more than any other leafy green. Root vegetables get a good scrubbing with a bristled brush to get fine particles of dirt out of all the nooks and crannies and to also remove the fine root hairs or eyes. I found it equally disturbing that the poster had to warn people NOT to wash their produce using soap or bleach. The best time to wash produce is immediately prior to preparation for cooking or eating. Even fruits and vegetables with outer rinds that are not eaten, like melons, should be washed prior to cutting. With the kick-off of the regular market season and warmer weather there’s going to be lots of gorgeous fresh produce showing up at the market straight from the fields and orchards. No matter how clean it appears or if it is Certified Organic or how much you trust the farmer, be smart and wash your produce. Today when I woke up, I groggily walked to the kitchen with the house lambs under my feet demanding their breakfast. It’s the same routine—run water into the kettle for my morning infusion of Zeke’s coffee and then make fresh bottles for them. They eat while the water comes to a boil and nap on full bellies while I enjoy a peaceful start to my day. But when I turned on the tap nothing came out. As a livestock farmer with hundreds of animals, many of them being lactating mothers, losing water is a daunting prospect. It requires a full-stop to any plans for the day other than the most pressing matters. Despite plans for a trip to town to run errands, a visit to Mom and a much-needed pedicure, I had to remain on site for when the well company and backhoe operator arrive. These are logistics of necessity, something every farmer and small business owner must learn to embrace. That’s why after six years of running a successful farmers market in Merrifield, Virginia, Central Farm Markets is moving a new location. We didn’t plan on making this change, but something akin to turning on the tap and finding no water occurred earlier this spring. Wasting no time, the management of Central Farm Markets got straight to work finding a new location that has also precipitated a new name. Only four miles from the former site, the market will now be located at the George C. Marshall High School, 7731 Leesburg Pike, Falls Church, VA and called NOVA Central Farm Market. An event that first garnered frustration has resulted in a market location closer to 495 with better parking. The new location will also be more accessible for the McLean, Falls Church, Fairfax, Vienna and Arlington customers. Starting April 7, 2019, the new market will operate every Sunday April to December from 8:30am-1:00pm and January to March from 9:00am-1:00pm. Just like my waterless spigot, to rectify this matter in order to keep everyone happy, there’s a lot of behind-the-scenes work that must take place. Recognizing how much both farmers and customers depend upon the Central Farm Market family, founders Mitch Berliner and Debra Moser got to work to ensure a regular season market would open with the close of the winter market at its current location. Dedicated to the communities in which they operate, Central Farm Markets will donate 5% of the market’s proceeds to the Booster Club on April 14, 2019 for Marshall HS Griffin Day, host local non-profits and continue the gleaning partnership with Food For Others. Is it a hassle? Sure, unexpected change always is. Both market management and vendors will have to adjust websites and social media as well as create new literature and signage. But there continues to be a bright side—room to grow, new vendors. However, unlike the opening of a new market location, when the water starts to flow again there will be no live music, balloons, prizes and fun—only a bunch of thirsty animals crowded around several empty stock tanks. And when the dust settles from all this then I’ll really get to dish some dirt. NOTE: The location of the Bethesda, Pike and Westfield markets will remain the same. I farm in a rural Pennsylvania township that is populated by less than six thousand people, 97.96% white. On Sundays I travel a little less than 90 minutes to Bethesda which hosts six times more residents who hail from all over the world. Nothing is more fun than bringing along a young farmer who hasn’t ventured far from their rural roots except for maybe a trip to the shore for summer vacation. Being fortunate enough to have traveled and been exposed to multiple ethnicities, religions and orientations prior to my decision to settle down and farm, heading into the metropolitan markets wasn’t quite the shock for me it was for the ride-alongs. I can, however, honestly say that my marketing skills and knowledge of international politics have been stretched further than I could have ever imagined thanks to Central Farm Market customers. The divisive politics and outright aggression currently taking place in this country and throughout the world pains me as I encounter rural farmers who sneer at my choice to trek down into the city to sell to those people while they bemoan the price of commodities, wishing the government would help them out instead of helping those people. The words, those people, linger in my mind and can’t be ignored. Those people are my customers, they’ve become my trusted friends, my beloved family. I see those people week after week, providing food for them without concerns as to what flavors will be added or for what feast it will be served. If it is one thing The Constitution and farmers markets have in common, it’s we the people. Everyone eats. We may not all eat the same things, but when food is served, we all sit at the table. Despite my homogeneous upbringing among Methodists in a small blue-collar town, when one of my Hindu customers grabbed my hand and leaned her head toward mine whispering a brief prayer into my ear before moving on it was one of the most moving moments in life I have ever experienced having come at the end of a most difficult day. Our customers heal us at times more than they will ever know. And speaking of customers, the melting pot at the farmers market helps make adventurous farmers more successful since many other cultures have different definitions of culinary delicacies. When picking up my processed lambs at my USDA butcher shop last year a fellow customer howled in disgust at the neatly vacuum-sealed heads as I loaded them into coolers in the van. “That’s just gross!” he said followed by an extremely offensive comment about who was buying them. He thought he’d had the last word until the owner of the butcher shop informed him that my customers have called the shop, thanking him profusely for cutting and packaging products they have been unable to procure in the United States, but are staples in their culture abroad. The ultimate dig? I get paid for the parts the other farmers routinely throw out. After all, if a farmer can’t make a profit how can they keep farming? Similarly, international customers’ requests have forced me into learning the Code of Federal Regulation for Animals and Animal Products which determines what parts of the animals farmers can legally sell for human consumption. Post-it tags adorn the pages for quick reference to diffuse arguments with USDA inspectors for unusual offal such as cow udder and caul fat. Several years ago, a customer shared his borek with me, tearing the delightful savory pastry in half. I thought of him last week when I chose my breakfast from Yufka Bakery, a delicious triangle of flaky phyllo stuffed with spinach and feta. I thought about the Korean buns and rice bowl that had been my Sunday morning staple all last summer and fall and I am so thankful that those people are my people whom I have the fortunate experience to have in my life every week. There are many ugly events and discourses taking place throughout the world, including here in the United States, but my faith in humanity is restored each week when I roll into Central Farm Markets. For four precious hours there are no those people (except for the rude customers who show up an hour early and demand to be served even though the vendors are barely set up). There is only us. Last week I had a customer ask if I would sell her some manure. The last time I was asked to sell poop it was back in the late 90’s to a rose gardeners’ club when I raised meat rabbits. Delivering the bags of bunny beans that had rolled down under the cages into gutters which were emptied into buckets, I felt guilty taking money for manure so one of the club members gave me a gift certificate to her restaurant. I joke each spring I give my mom a load of crap that makes her happy, unlike when I was a teenager. But as I’ve learned over the years, it’s not manure that should be put on the garden, it’s compost. There’s a difference. Everyone thinks that manure is animal waste…not true. Green manure, commonly referred to as cover crops, are plants grown to protect the soil during non-production and then plowed under to increase organic matter prior to planting. Sometimes cover crops also serve the additional purpose of fixing nitrogen in the soil. Is the nitrogen broken? No. “Fixing” nitrogen refers to the process that turns the nitrogen gas in the air into compounds that plants are able to use. Plants that have the capability to fix nitrogen have nodules on their roots that convert atmospheric nitrogen into water-soluble nitrates. Nitrogen is the most used element by plants on the planet. Without it, nothing would grow. As a livestock farmer however, my manure is brown. It’s also hot, not only in terms of temperature, but in the amount of soluble nitrates, mainly ammonia. To combat high nitrogen levels in manure and urine from animal waste carbon is needed. Herbivores, such as cows, horses, goats, sheep and rabbits have a lower amount of nitrogen in their manure as opposed to omnivores such as pigs, turkeys and chickens. Living in rural Pennsylvania where industrial hog and poultry barns dot the landscape, I’ve learned to tell the difference between species when the wind blows. It’s not hard. When the dairy farm spreads their liquid manure, I might light a scented candle or burn a stick of incense, but when hog sludge or poultry litter gets spread, I need to close the windows…fast. Blame it all on the nitrogen breaking down into ammonia. As a pasture-based farmer, the animals spread their manure themselves except in the winter when they are kept out of the pastures due to the damage they can wreak on dormant grasses with their hooves and over-grazing. Manure collects around the hay feeders and in the barn where the mommas and babies are sheltered. In order to control the ammonia build-up, carbon must be regularly added. Carbon can be straw or sawdust. While sawdust is more effective at reducing ammonia, straw keeps the animals warmer during inclement winter weather and funnels away moisture. Why don’t I clean it up before the nitrogen breaks down into ammonia? A few reasons. The decomposition of manure is temperature dependent. During bitter cold weather the breakdown is extremely slow. However, it is still decomposing which is an exothermic reaction, meaning it gives off heat. A good bedding and manure pack will help keep animals warm and build up what amounts to insulation between them and the bare ground or concrete. The biggest reason, though, is logistics–where to put the animals when I clean out the areas in which they are housed. Mucking out a single pen housing a ewe with a few lambs is easy, requiring only a pitchfork, a bucket and a few minutes, but hundreds of animals means heavy equipment and several hours. “I bet you’re happy the temperature is warming up,” is a common greeting from my customers. Yes, lovely. For the next few weeks my life will revolve around moving tons of manure from the winter pens and paddocks to long windrows behind the hay barn where it will continue the process of breaking down into rich, dark, moist compost that can safely be spread on the fields and crops without overloading the plants with nitrogen which will either stunt their growth or kill them. In addition to manure and soiled bedding, my compost piles include mortality. Mortality composting is the safest way to properly dispose of dead livestock and butchering waste. Small ruminants can be reduced to little more than bones in a few weeks, calves and pigs in a few months and larger animals in a year. All compost needs to be turned to incorporate air to allow for the microbes, bugs, beetles, fungi and worms to do their jobs. Occasionally when I’m doing this my neighbors will hear me squeal like a little girl as the skid loader bucket turns over a nest of freshly hatched snakes who like to lay their eggs in the warm piles. How hot do the piles get? Plenty hot. A good pile of compost can reach 170 degrees Fahrenheit, but the average temperature hovers around one hundred degrees. These temperatures not only reduce the nitrogen in the manure, but also break down the cellulose into soil, and bake weed seeds to prevent gemination. Innovative farmers collaborating with chefs have been experimenting with building giant sous vides by vacuum-sealing whole vegetables in bags, packing them in a sealable drum with water and them burying it in a compost heap a few days ahead of the big party. I guess you could consider that a vegetarian’s version of a pit-roasted pig. Spring means spreading the old piles, making new piles and yes, even giving a few bags away to a customer. I hope she owns a restaurant. One of my favorite agricultural mentors once told me that farming is the oldest form of legalized gambling. “Do you think they could build all of this if the house lost more than the bettors?” he asked, sweeping his arm toward the strip of casinos lighting the desert night as we passed through without stopping to try our luck with what else, a one-armed bandit. As the years have rolled by, I realize old cowboy Jack’s wisdom, especially as I don my union suit reserved for brutally frigid temperatures to do farm chores this morning. My outside to-do list sits idle, as do my fellow farmers’ tractors, as we wait to get started on the 2019 season. No where was this more evident than the pictures from Bending Bridge Farm between this time last year and this year. You can’t plant your fields when they are covered in snow. The gamble to farm is more than just betting against the weather. While most people would welcome a burst of warm weather in relief from winter, fruit growers hold their cards against such events that signal their trees to blossom prematurely only to lose to a late spring freeze killing off their crops (and your cobblers) for that year. In addition to Mother Nature, farmers are increasingly forced to bet against the government. There are more federal, state and municipal regulations and oversight hefted upon farmers than the average consumer realizes. Much of it is under the guise of food safety despite the reality of food-borne illness outbreaks coming from large-scale, multi-national conglomerates transporting goods across multiple levels to reach the consumers. My livestock is required to be processed under USDA inspection in order to be sold across state lines and by the cut at a public farmers market and I’m ok with that. But the niche slaughterhouses and meat processors who bet on the growing demand for locally grown and processed meats are losing against the insurmountable bureaucracy treating them the same as their industrial counterparts. Forced to maintain a mountain of paperwork, much that pertains to none of their business, small processing plants are buckling and closing creating less access to locally produced and processed meats. Similarly, small-scale farmers wanting to attend community markets may need to obtain permits from multiple agencies—state, county, borough/city—in addition to their market fees and liability insurance. Want to sample your products? That means you’ll need a ServSafe® certification and an additional license. Add into that the 22 assorted commodity statutes known as “check-offs” that require farmers to pay into a pool to fund research, promotion and lobbyists. Beef, pork, lamb, eggs, fresh-cut flowers, dairy, watermelons, and honey to name a few. See how it feels like someone is swiping chips from the farmer’s pile? To hedge their bets, farmers are moving away from a single specialized crop. Dairy farmers are dropping like flies, but the ones holding on and even succeeding, such as Rock Hill Orchard, are who have diversified, be it bottling their own milk, making value-added products like cheese, ice-cream and yogurt or adding non-dairy crops to their operations. Losing the bet on an early spring means I’ll be playing chicken with the hay supply meaning will I have enough stored hay to get me through until the pastures are ready. With snow-covered fields in March, that’s a bet I’ll most likely lose. At one time, that meant choosing between buying hay or heating oil, a dilemma I’ve come to find I am not alone in talking with other agrarian gamblers. But the biggest bet of all is the customer. Will they show up to market and buy what we grow? When I was a kid stopping with my dad at a seasonal roadside stand in the summer to buy cantaloupes and watermelons, we went for the largest ones we could find in the bin. When those same farmers started attending metropolitan markets, they found that their customers didn’t want to carry gargantuan melons and placed bets on growing heirloom versions that were smaller, easier to carry. Sure, their bets paid off well until Mother Nature offered up one of her wettest growing seasons in years flooding the fields, floating the melons to rot in standing water. The house won again. Every step of getting food on to your plate is full of bets. Bets against changing climate. Bets against increasing regulation. Bets against competition with box stores and resellers. However, unlike traditional gambling problems, there is no treatment or Twelve-Step program for those of us with addictions to agriculture. We will gamble with our last dime and then some when it comes to producing food. Some call it a sickness or mental defect, others refer to the desire as a calling, a passion. I think it’s a little of both as I continue to lay down my chips in the pasture betting that I’ll beat the house this season safely getting my products to market. If you want the same products week after week, always in stock and preferably on sale without any regard to how they were produced or where they were grown, shop at a corporate grocery chain, not a farmers market. Complaining to the farmers won’t get you fresh asparagus a month early or fresh pastured roasting chickens when the ground is frozen solid. I’ve beaten this drum regularly for the last year while writing Dishing the Dirt, but we’re at the tail end of winter and I’ve noticed that customers are getting cranky. I recognize there are people on this earth that no matter how good they got it can only see the glass as half empty, however, I am a stalwart optimist when it comes to local foods. Winter markets are tough on vendors as it is, these last several weeks being the most challenging start to a new year. Last Sunday when a customer complained about the “lack of variety” of fresh vegetables, he picked the wrong person to air his complaints. I was quick to point out his bag of three different colors of carrots, a few heirloom tomatoes, a bag of kale and bunch of tatsoi he had clutched to his chest. We’ve been your farmers for how many years? Yeah, we know who the die-hard regulars are and these last few weeks have even been a struggle for them (and we dearly thank you). With the combination of no rain and mild temperatures, the markets were full and busy this past week, many forgetting winter market hours begin an hour later. Talk about hitting the ground running. Having been winter farming for at least ten years, many of the farmers at Central Farm Markets have made significant capital investments in greenhouse and food storage technologies to bring customers both seasonal and extended season fresh produce in the winter months. Why? Because of how well-supported we are by a loyal customer base. If you grow it, they will come. This is our commitment to customers…we’re not here for the convenience. Along that same vein, as farmers we have to keep our personal commitments. How many weeks prior to the end of the year did Rob Young warn his loyal greens lovers that during the winter he’d only be here every other week? Please don’t begrudge that man his Sunday mornings off with his family when there isn’t enough salad growth to warrant a trip to market. Worried about not having enough? Buy an extra bag; it will last just fine in the fridge. Trust me. If customers knew how physically demanding field fruit and vegetable cultivation is, they’d welcome the down time to have a personal life. Don’t even get me started on livestock…. While markets have strived to add convenience for our customers in many ways—multiple communication outlets, lots of parking, market concierge, gift certificates—the truth is we are here because of our commitment to a robust local food system with an emphasis on sustainable farming and business practices as well as community involvement. And when was the last time you heard a talented musician playing a Leonard Cohen tune live while you shopped for groceries nibbling on a genuine French or Austrian pastry? That stuff doesn’t happen in convenience stores. We’ve got five winter markets left in 2019. Let’s make the best of them no matter what Mother Nature hurls our way. Don’t forget to get your Winter Market Loyalty card punched because your commitment to Central Farm Markets from January to April earns a tangible return. There’s nearly a foot of snow on the ground, but before Mother Nature laid down her white blanket, I’ve begun seeing more signs of spring around the farm and at Central Farm Markets. Horseradish has begun peeking through the dirt and the hair sheep are beginning to roo their winter coats which is when their fleece peels off to reveal a slick warm-weather coat. Last week I spied one of my late-winter favorites at market—green garlic—a sure sign spring is just around the corner. Although we are fortunate to have growers who utilize an assortment of greenhouse technologies to keep us in leafy greens, winter root vegetables and even cucumbers and tomatoes during the winter months, green garlic begins showing up at market mid-winter as growers begin thinning their garlic beds to make room for the mature bulbs. It is the labor-intensive process where immature vegetables and fruits are removed to make way for larger, mature growth. When my father was a kid in the wilds of Pennsylvania fruit country, his job was to thin young peaches from his uncle’s orchard. His work paid off with softball-sized fruits sold on the family’s road-side stand and put up in jars in his mother’s basement. These are the behind-the-scenes chores that go on prior to the picking of premium products. But unlike peaches, vegetable thinning yields a salable and often sought-after product, like green garlic. Not to be confused with garlic scapes, the curly shoots with tightly closed buds on top which show up at market later in spring, green garlic is basically baby garlic. Right now, you’ll find bunches similar to scallions but instead of hollow tubular leaves, the green garlic’s leaves are flat. As the weeks go by, the individual bulbs will begin to swell and divide, but the paper-like husks on the bulbs will be tender and moist. Green garlic is valued as much for medicinal as it is a culinary staple. For over 5,000 years, garlic has been cultivated for its immune-boosting properties. Garlic contains the protein ferroportin, responsible for carrying iron from inside a cell to outside a cell. Garlic is also rich in polysulfides and manganese, both critical for heart health. Prior to modern medicine, green garlic was prescribed as an anti-inflammatory, antiseptic and even an aphrodisiac! Want to give green garlic a try? The first thing you have to do is get to the markets early as it tends to get snatched up in the first hour. Once you’ve scored your bunch, figure out what delicious meal to try and then make your way around gathering all the necessary ingredients. Green garlic can be used raw in salads or as ingredients in a simple oil & vinegar dressing. My favorite is to mix green garlic with fresh mozzarella, tomato and cucumber. Green garlic can be used in place of regular garlic or onion in just about any recipe. But if you’re really in for a hefty dose of garlic breath, give this recipe a try and toss with fresh pasta. In a blender or food processor, pulse together green garlic and nuts until they reach a granular texture. Gradually add in olive oil and cheese. Season with salt to taste. What Does Ethylene Have to do With Food? Every now and then I’m reminded of how sheltered I am in my agrarian bubble where everyone is onboard when it comes to local, seasonal food produced by small farms, many using some type of regenerative practice and who aspire to deliver products that meet both our philosophical values as well as our customers’ demands. Recently, a customer passed along this full-page advertisement in the Wall Street Journal and asked what I thought. My first reaction was that there was no way anyone would find a fresh American peach in the midst of a polar vortex. Sure, you can find fresh peaches at gourmet grocers, but the label will be from Chile and they won’t taste like much. Any hankering for local peaches can still be satisfied while shopping at Central Farm Markets’ winter markets, but you’ll find them in a jar or a can…not fresh in a mitten. After reading the text, I tried to decide if it was the peaches making the ethylene or the American Fuel & Petrochemical Manufacturers (AFPM). Ethylene is a colorless, flammable hydrocarbon gas given off by fruits such as peaches, apricots, avocados, bananas, melons, mangoes, papayas, pears, plums and tomatoes that promotes ripening. Alternatively, there are ethylene-sensitive foods which should not be kept with those foods that produce ethylene. They are apples, asparagus, broccoli, carrots, cucumbers, eggplants, green beans, leafy greens, potatoes, squashes and watermelons. Farmers have long understood the mechanics of ethylene production in plants. Ancient Egyptians and Chinese utilized both the plants’ production of ethylene and external sources such as incense to hasten the ripening of figs and pears. Today, ethylene is the most widely used organic compound by the chemical industry in the world. But let’s be honest about the ethylene the advertisement is talking about. Given that the AFPM shelled out nearly a quarter million dollars for that full-page ad, they’re not making plastic bags, milk jugs and food wrappers out of rotting fruit. The majority of ethylene is created out of the distillation of oil and gas by a process called steam cracking. The process has been in use since the late 1800’s and utilizes heat and pressure to break down large hydrocarbons into smaller ones. Having worked in the petroleum industry for many years prior to farming, I am well aware of the energy and technology needed to get crude out of the ground and into my gas tank. Maybe that’s why farming has quelled the overwhelming hugeness of it all as I strive to use as little as petroleum as possible knowing well the environmental costs. But there is no escape from ethylene, even at the farmers market. Meat in plastic vacuum-sealed bags, plastic containers, fuel to get there, the tables, coolers, tent, the boots keeping my feet warm, my iPad and credit card transaction stand. And if you think I’m just being cheap when you request a bag and get a single-use plastic bag now on a second lifetime, you’re wrong. I still believe that every little step I take to reduce petro-chemical dependency is a step in the right direction. That’s why I farm.